A small family house located in rural west of Ireland. The project seeks to find a solution to the spread of bungalows that have blighted the beautiful Irish countryside, not by prohibiting development, but by rethinking what an Irish rural house is! 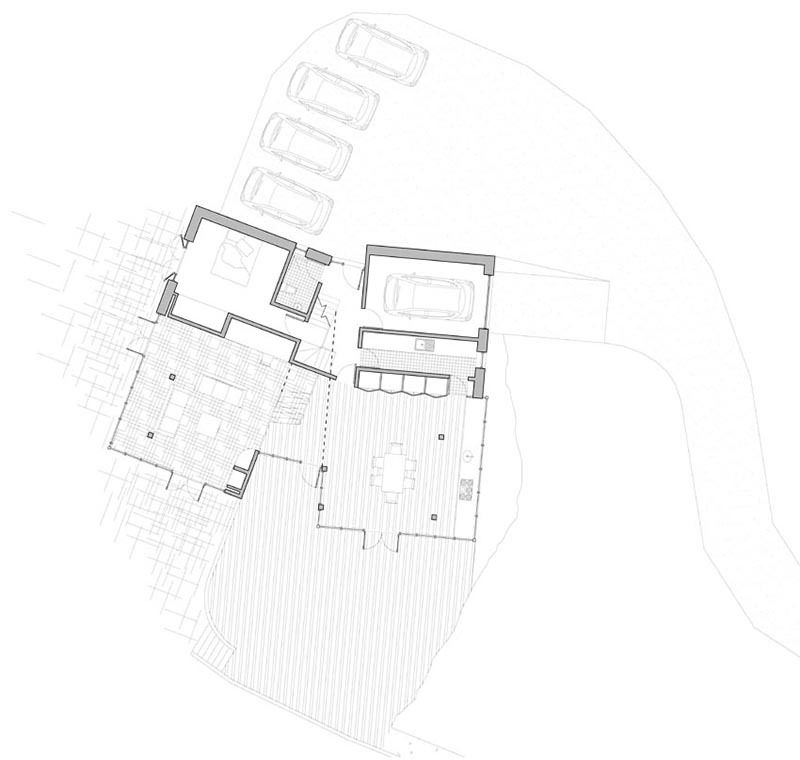 The design is generated from an analysis of the surrounding landscape. The site is located in the heart of an area with many lakes which are the result of retreating glaciers giving rise to drumlin fields. Essentially this area is lowlands with a large number of lakes and hills and conceptually the house is a condensed form of this landscape. Externally the prominent materials are grass and glass. The grass roofs mimic the surrounding hills and the glass windows will reflect the sky just as the water in the lakes reflect the sky. The glazing is sloped towards the sky to further enhance the reflections of clouds. Drumlin hills are created when the glaciers moved over a hard outcrop giving them a long drawn out form. 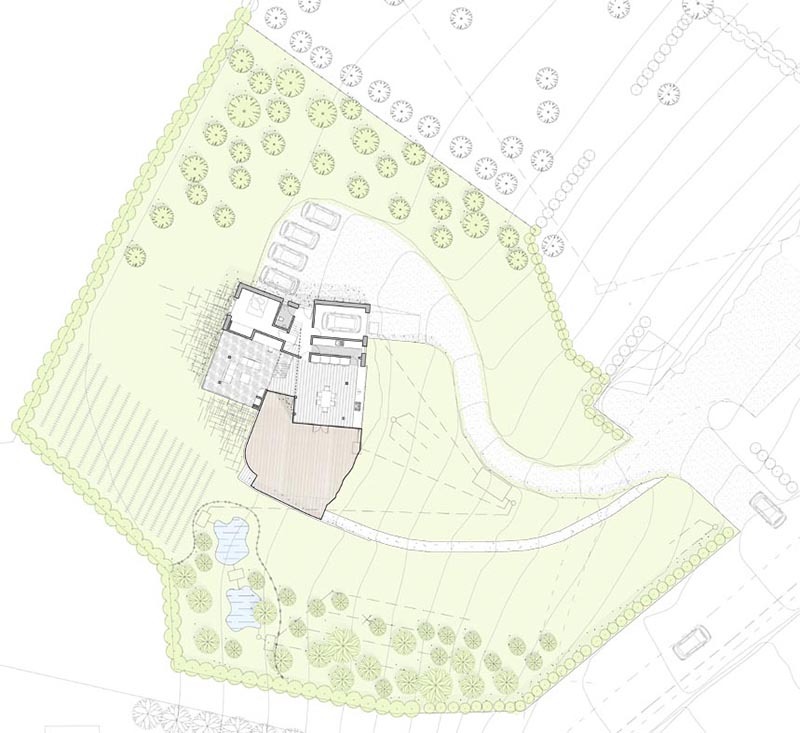 The long axis of the proposed house is orientated to follow the long direction of the hill and it will therefore flow with the landscape. The building emerges from the hill as a manipulation of its grassy surface. The site contours are moulded to create a sheltered patio space to the south and a sunken parking area to the north. The section has been intelligently stacked so that all rooms have views of the nearby lake. The ground will rise to the height of the kitchen counter, creating a continues surface from the worktop down the hill. The roof will be covered in grass sods taken from the where the footprint of the house is excavated and at a glance the house will appear to emerge from the site. The floor plan is laid out to assist passive solar gain. Living spaces are located to the south with access to patios and decks through large glazed doors and windows. Service rooms are located on the north with small openings. A double height atrium splits the house with glazing to the south. Heating and waste management are designed to cause minimal damage to the environment. In fact water will be collected from the roofs for washing and minerals will be collected during waster water treatment for returning to the land. Construction materials and details have been chosen to use recycled or renewable materials wherever possible. Use vegetation and landscaping to protect the house against dominant prevailing winds. The house is located so that the outdoor living areas are on the south side. The house is designed to increase solar gain. Living rooms are on the south side, service rooms on the north. The majority of glazing is on south façade with small openings to north. The south glazed double height central space will act as a chimney circulating warmth generated by solar gain. ´Green Roof´ The grass sods removed when excavating for foundations will be reused to construct a grass roof. This will not diminish the natural habitat for native species that the foot print of the house takes. 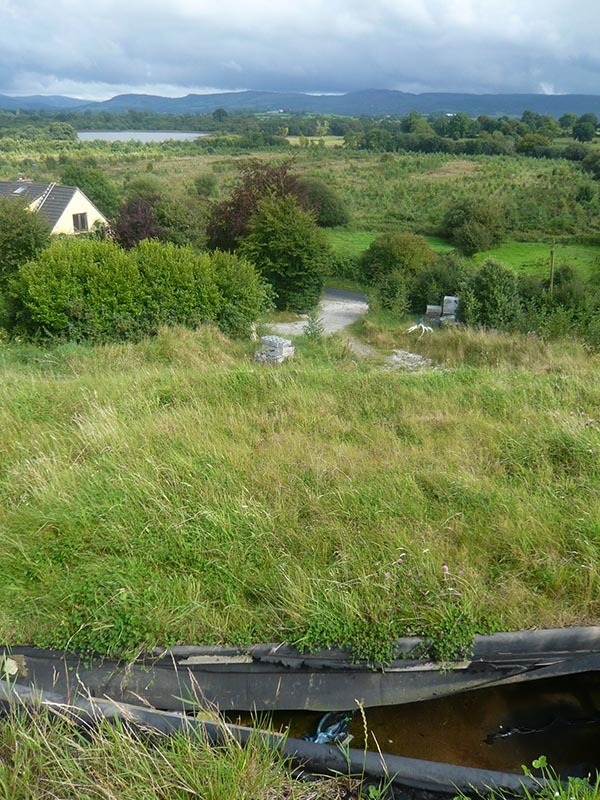 Grass roofs do not create impermeable surfaces that have to be drained. They have a capacity to retain rain water therefore stabilising the flow of water discharged. Grass and soil do not require manufacturing therefore do not produce waste during production and do not diminish mineral resources. The ground floor walls will be constructed with cellular terracotta blocks. They are made from clay which has low embodied energy (energy required to manufacture and therefore the quantity of carbon created during production). They have such a high insulation value that they do not need any additional insulation, therefore eliminating rigid insulation. Rigid insulations are manufactured using heavy chemicals and large amounts of energy. Plus the gasses given off after installation deteriorate indoor air quality. It is a breathable system that helps improve internal air quality. The upper floors will be constructed using timber frame construction. Timber being a renewable material doesn´t require large amounts of carbon to fabricate, unlike concrete. Its growth also helps absorb carbon gasses. 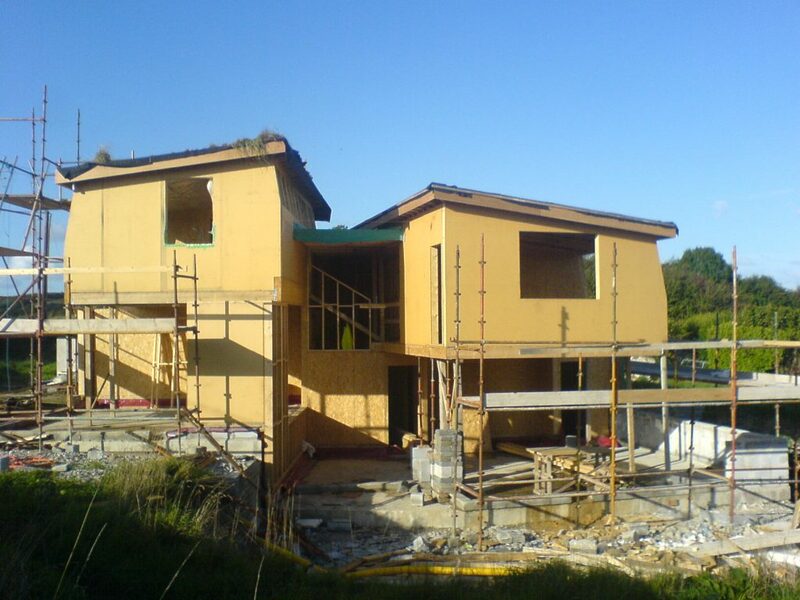 Plus timber frame construction allows higher levels of insulation to be installed. Use cellulose recycled newspaper insulation. It doesn´t have the high levels of embodied energy (energy required to manufacture and therefore the quantity of carbon created during production) associated with chemical insulations, plus it reuses a waste product. Vacuum tube solar water heaters. They will meet a large amount of the house´s hot water need doing away with a fossil fuel boiler. Vacuum tube solar water heaters have a higher efficiency than flat plate solar panels. They can be rotated to optimize the sun rays at this latitude. A geothermal heat exchange system for water/space heating. These systems take the heat from the ground and transfer it into the house. They are extremely efficient; for every part of electricity used they create 4 parts heat. The house will be supplied by Airtricity Ltd. ensuring that the electricity used is created by renewable means i.e. wind power. The site is ideal for a geothermal heat exchange system which requires around 200m2 of unpaved ground. Collect rain water for use in none food applications. Use a facial matter separator instead of a conventional septic tank. This collects the solids from toilet waste and composts it for fertilizing trees. As well as capturing vital nutrients it reduces the load on the waste treatment system. Reed bed waste water treatment system. Used in conjunction with the separation chamber this achieves higher levels of purification without the use of chemicals or mechanical systems. They also collect heavy metals created by the use of cosmetics, soaps and detergents, preventing them from entering the soil or water table. For more details see the enclosed additional information from supplier. Connect to a renewable energy electricity provider. This insures that all electricity is produced by renewable sources, mainly wind power. All appliances and installations will have low energy ratings. Fridge, freezer, washing machine, dishwasher, oven, hob etc. Only biodegradable soaps and detergents will be used. This reduces the load on the wastewater treatment system making them more effective. This also reduces heavy metals building up in the soil or water table.